When you select a destination for documents fetched by FileThis, one option is "My Mac or My PC" for storing documents on your computer. If you select this option, be sure that you have a backup plan in place for your computer. In addition, your computer will need hard drive space for all the documents. 1. The FileThis servers connect to the institution and fetch any available documents. The documents are stored on the FileThis servers. 2. Every four hours, the FileThis Fetch desktop application on your computer checks with the FileThis servers to see if any documents are waiting; any waiting documents are downloaded to your computer. The FileThis Fetch application runs in the background at all times and automatically checks in with the FileThis servers every four hours. If FileThis Fetch is not running or your Internet connection is interrupted, FileThis Fetch may not be able to fetch documents. To confirm that FileThis Fetch is running, check the menubar (Mac) or system tray (Windows) for the FileThis Fetch icon (three horizontal orange bars). If necessary, search for FileThis Fetch and launch the application. 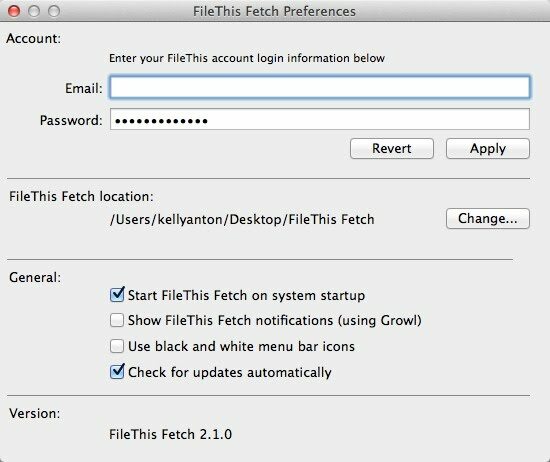 By default, FileThis Fetch places a folder on your desktop for your fetched documents. To change the folder's location, click the FileThis Fetch icon in the menubar and select Preferences. Click the Change button in the FleThis Fetch Location area. If you are concerned that files are missing, click the application icon in the menu bar and select Check for Documents Now. 1. Click the FileThis Fetch icon and select Preferences from the menu. 2. In the Preferences dialog box, enter your FileThis credentials in the Account area at the top. 4. Click the Preferences dialog box's close box. 5. Click the FileThis Fetch icon and choose Check for Documents Now.